Review of Short’s Cup A Joe Coffee Crème Stout | Beer Apprentice - Craft Beer News, Reviews, Interviews and Info. Hi folks. 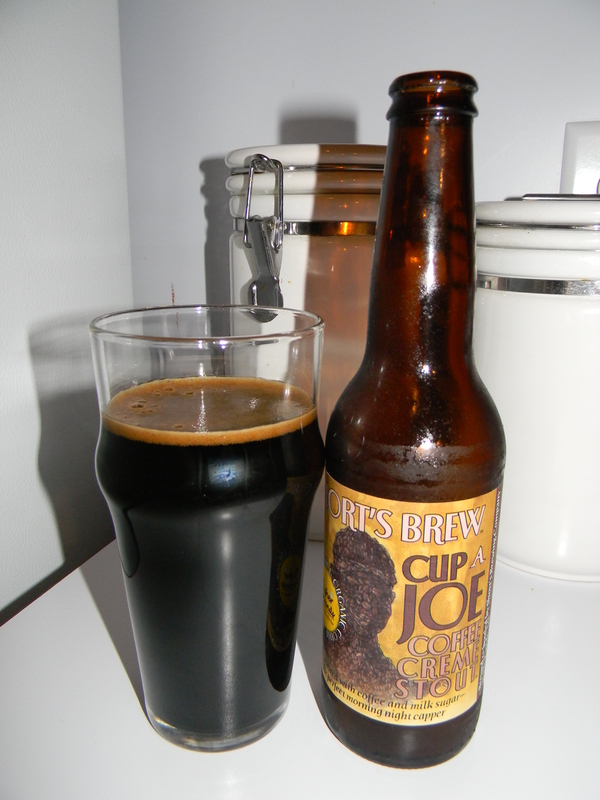 Thanks for checking in on this craft beer review of the Cup A Joe Coffee Crème Stout produced by the Short’s Brewing Company located in Elk Rapids, Michigan. A big shout out goes to my Michigan connection (he knows who he is) for sending me this brew. The few Short’s beverages that I’ve had have been worth the trade effort. Let’s check out the website, shortsbrewing.com, to see what they have to say about the Cup A Joe Coffee Crème Stout. A brew uniquely different from most coffee stouts, we cram Higher Grounds roasted fair trade espresso beans into every facet of the brewing process. Prominent aromatics of malt, espresso, and cocoa are abundant and create a flavor robust with big malt characters fused with cream and coffee. The perfect morning night capper. Sounds like my kind of beer. Let’s drink. This beer came in a 12 oz. bottle and it had an ABV of around 7.0%. It poured a black to deep brown color. No highlights were seen peeking through even when I held it toward a light source. A very small and insignificant head was formed from a relatively aggressive pour. The crown that did develop was dark tan, smooth and creamy. The retention time left a little to be desired and the lacing was mostly non-existent as well. Even though the beer lacked in appearance it totally redeemed itself in the aroma. Lots of freshly roasted coffee and espresso tones. Very nice!!! Just a touch of dark chocolate along with a hint or two of cream and whole milk. I love the bouquet of these Coffee Stouts!!! Without a doubt, the flavor presented some savors of roasted coffee bean. Semi-bitter dark chocolate as well as some chalky characteristics. I even got a taste of caramel chocolate candy. I also thought that the milky aspects were quite satisfactory. It kind of tasted like “half-n-half” cream. Very tasty in my opinion. The mouthfeel was medium to full bodied. Smooth, chalky, dry and chewy. It wasn’t as creamy on the tongue as I thought it may be though. Oh well. The carbonation leaned toward the lower side too, but an excellent amount of pungency was left behind on the palate for me to enjoy between sips. This is a true “coffee” beer. Very, very good. It would be perfect for the cooler weather of Winter. For me, it doesn’t quite measure up to the Founders Breakfast Stout (which is the top dog of the style in my opinion), however this would be a more than worthy substitute if you can obtain a bottle. The drinkability is good, the aroma is choice and the taste is very desirable. The Short’s Cup A Joe Crème Stout is not trying to hide anything. It’s all about the coffee and that’s just fine by me. If you guys happen to be in Michigan during the Winter months and you see this sitting on the shelf…. pick it up and give it a try. I doubt that you will be disappointed.